Review HashFlare 2019: Scam or Legit? Hashflare is a cloud mining provider which offers mining contracts with different algorithms for individuals. Hashflare is one of the largest cloud mining providers and has been active in this market since 2014. The mining of cryptocurrency can only be done by large companies with large mining farms. The mission of Hashflare is to make these mining farms accessible to individuals, giving everyone a chance to start with mining and making money. Register an account and start mining! Register now with Hashflare.io and start mining Bitcoin, Ethereum, ZCash or Dash. What can you do with Hashflare? The Hashflare service allows you to buy computing power (hashpower) for a certain period of time. With this hashpower , the chosen cryptocurrency is automatically mined. The more hashpower you buy the more you’ll earn. Hashpower is expressed in hashes per second and based on this amount the price is determined. So you can rent a part of a mining farm, and you can keep the profits. For some contracts, you will have to pay a maintenance fee, but for others it isn’t necessary. The advantage of renting a part of a mining farm is that you don’t have to have a big budget to invest. You can decide how much you invest in the program and it can start from $ 1.50. In addition, you don’t have to buy expensive hardware yourself, you do not have to worry about the fact that components stop working or maintenance and you don’t have high energy bills. The first thing you need to do is to register an account by Hashflare.io. 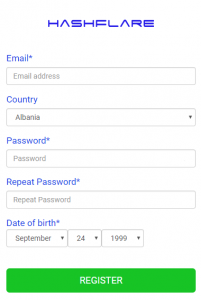 The registration form speaks for itself and the creation of an account is completed within a few minutes. Above each algorithm you’ll see your balance for the relevant coin. In the revenue forecast you’ll see what you’ll earn periodically with your purchased hashpower. If you just registered, all values are 0 and you have to buy hashpower using the Buy Hashrate button. It’s very easy to buy hashrates at Hashflare, and this goes by sliding the scroll bar at the right amount. This indicates how much hashrate you’re going to buy and what it will cost. We’ve made a price table of the current prices for different algorithms. You’ll see here that only the SHA256 and SCRYPT algortims charge a maintenance fee. The maintenance fee for Scrypt is: 0.01 $ / 1 MH/s per 24h and the fee for SHA256 is: 0.0035 $ / 10 GH/s per 24h. These are extra costs that you have to pay attention to. Note: The revenue forecast shows the profits where this fees haven’t yet been deducted. So keep in mind that your returns are slightly lower. No fees are charged for the Ethereum, ZCash and Dash contracts. After you have selected how much hashpower you want, you can go to the payment page. On this page you can complete your order. If you have a special Hashflare promo code then you can enter it here by clicking Redeem code. Payment is possible through Bitcoin, Emercoin, wire transfer, credit card, Webmoney and Payeer. If you already have balance in your account, you can pay from your own balance. If the payment is received by Hashflare, they’ll start immediately with mining. The first payout will take place after 24 hours. Is Hashflare legit or a scam? In our opionion, Hashflare.io is legit. The company exists since 2014 and is very transparent to their customers. The fees, costs and revenues are presented well and clearly. Payouts at Hashflare work flawlessly and are extremely fast. Within a minute the Ethereum was transferred to our Coinbase wallet. This is a great advantage of Hashflare compared to other cloud providers, where the payout period takes several days and is restrained by restrictions such as a maximum payout amount or horrendous network fees. With HashFlare your own coins can be paid out immediately and without problems. Another great feature is that you can reinvest your returns and that you can pay from your own balance. Good and reliable cloud mining provider offering multiple contracts for different cryptocurrency. This company has been active in this market for many years and has built a big name. We're very pleased with our profits and the payments were extremely fast. By reinvesting our revenues we can use compound interest. They support many different payment methods, making it easy for anyone to pay. The customer service is ready for all your questions and responds quickly.